This post is sponsored by Comfort Works. Hello out there in blogland!! I am very excited to share a great company with you today! Comfort Works is an Australian based company that makes custom slipcovers for IKEA sofas. I realize not everyone has an IKEA sofa, but never fear, Comfort Works also creates custom curtains, quilt covers and pillow covers! Yes, I said custom. But the great thing is that they are affordable as well. Comfort Works contacted me a while back to see if I would be willing to review a slipcover for the Ektorp chair that is currently in my home office. Once I visited their website and saw all of the great fabric options, I was so excited, I jumped at the chance. Trouble is, there were so many great choices, I just wasn't sure what to do. No problem! They sent me a bunch of free swatches from my favorite fabrics so that I could make sure I was completely happy with my choice. I ultimately settled on Elizabeth Green which was the perfect shade of aqua to go in my office. And once the slipcover arrived, I was amazed at the quality. The fabric was thick and soft, and completely washable. The slipcover went on like a dream. Overall, much nicer than the IKEA slipcover I had on the chair. Truly high quality for a great price. If your worried that the shipping from Australia might negate the affordable slipcover, you don't need to be. Just $25 flat rate shipping. Amazing, truly. I really wish that the photos of my slipcover could do it justice. (That's what I get for having a home office in the basement - with no windows might I add.) But, trust me, it's lovely. And it's so nice to have an option besides the plain white cover I already had. And today, you're in luck, because the good people at Comfort Works are offering $50 to one reader of the Shabby Nest to spend on anything Comfort Works has to offer. That means if you don't happen to have an IKEA sofa, you could spend it on a quilt cover, or curtains or a pillow cover. So what are you waiting for? To enter simply leave a comment on this post. You can tweet, Facebook or blog about this giveaway for additional entries, but each entry must have it's own comment to be valid. Giveaway open until Friday, April 15 at 11:59 pm MST. The legal stuff: I was provided with a slipcover in exchange for this product review. However, all opinions expressed in this review are entirely mine. Oooh, I would love to get some new pillows!!! I would love to have some of their custom made drapes. The choices are really nice. Thank you for the giveaway! Wow, your new slip cover looks great, and how good to have the option of changing it now and then. I must check out that website. Thanks. oh my, oh my! I would love to do a mini-redesign! We just moved. Great prices for window treatments. Would love to go shopping. I need some living room curtains! Fabulous! Great fabrics and very creative products! Would love to add a few to my home! Awesome! I might get something at Ikea just so I can order one of their great slipcovers!!! Thanks for this! Great stuff! Hope I win! You new slipcover looks happy! I have two wingback chairs that I have been trying to find something for. (I could make them, but don't want to spend the time on that now.) I also have a huge Ikea L-shapped sofa that has been beaten up by teenagers. Would be nice to freshen it up! Thanks for the offer. I am going to look at their site right now. 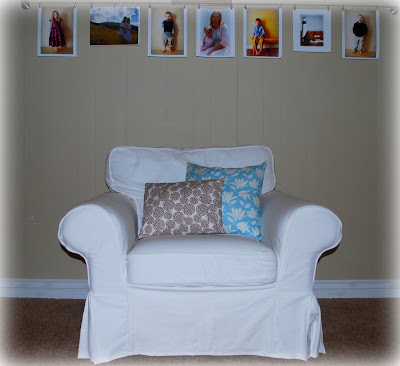 the slipcover really is very pretty, I would love some new curtains for my guest room or maybe even my son's room, thanks for the opportunity! Great giveaway! This is new to me so I'm off to check them out. I could use a new slipcover or pillows. Thanks for the opportunity to win something really cool! Ooh I love the stripe you chose. All my furniture is ikea ektorp from craigslist. I would love to win! who doesn't love a darling slipcover! Bring it on! I would love to get some custom drapes! Love it, I would love one for my kid's playroom!! yay for new curtains! love the sound of that!!! I would love to win this giveaway; this would be the missing puzzle piece to the flow of my apartment! That would be great. Ektorp sofa and two chairs. Oh, the choices. Thanks for offering the contest. Yay! I'm not a fan of Ikea stuff buuuuut I could use some custom pillow covers. Thanks for the giveaway! This is great I hope I win! So excited that I just found your blog. Looking forward to returning often. Love the slipcover too!! So exciting! I could totally use this for some spring decorating! I DO have an IKEA Ektorp sofa! I am doing some decorating in my new house. I would love to win! I could use a quilt cover. Count me in! I love slipcovers! Especially as I am married to a construction-loving, dirty clothes-wearing husband! I'm working on a girl room just for me...would love to win this as I am loving some of their fabric!! Thanks for posting this giveaway. Starting out with my first apartment, Ikea has been amazing. I had no idea that this company had different slip covers especially for Ikea sofa's and chairs!! YYAHHHHH!!! Thanks for putting this out there - can't wait to explore and do a little shoppin' now! This would be great for the redecorating that I want to do!! Thanks for the great info on a great site! This is wonderful! We are having an addition built and all decorating will have to be done on a shoestring. Which means some of the new furniture will be Ikea and the rest will be stuff that is "found" so it will be nice to have something that can be changed out and washed especially with 3 teen boys and a HUGE dog! They're "stuff" looks great! I would love to win. Oh, thanks for sharing! I'm pretty well in love with them now...the curtain choices make me smile really big! That's awesome! I have the Ektorp sofa in WHITE at home, and was just about to replace the cover because lets just say.... it's not as white as it used to be!!!!!! Great giveaway!!! I don't have a piece of upholstered IKEA furniture but would love to cover something else! Love that! I've definitely got some things that could use some covering TLC!! Would love some custom curtains or pillows. Getting new sofas this week and it's time to start redecorating! I need some new curtains! I've been wanting to redecorate my master bedroom. A new quilt would be a great start! I am moving and need new curtains! But, I also need new pillows for my couch and I would love a new bedspread... so many great choices! I really like the striped slip cover you chose. Looks great! 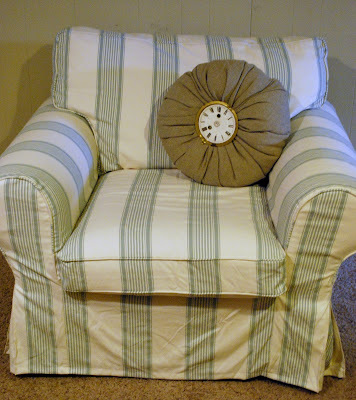 would love to redo the look of a chair or my sofa ~ these slipcovers are beautiful! This giveaway would be awesome since I'm redecorating my bedroom! I need curtains so bad it's shocking! Bet you wish you were my neighbor! Wow! So glad you found this company! What great options!!! What a great idea and they've done a good job. Count me in! Ooo... I would love a new cover for my thrift-store-found bedroom chair. Cute! Now only if there were an Ikea within a 300 mile radius, but no - so I guess I could settle for some curtains for my new baby girls room! ;) I would LOVE to win! OMG! 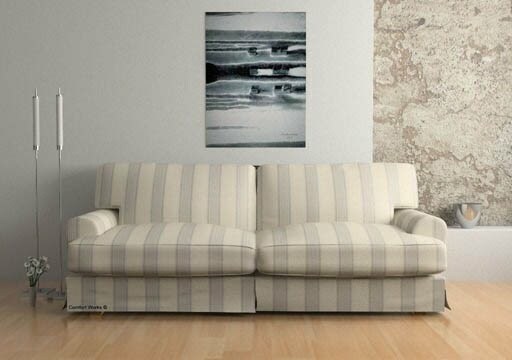 I am in desperate need of a slip cover for my ikea sofa! I have two HAIRY kitties and my sofa is looking worse for the wear- this would be a blessing! I'd love to have some new Aussie-made pillow covers! I LOVE the slip cover!!!! i have an ekrorp sofaand it would be awesome to pick out a new cover! I really want an IKEA slipcovered sofa. It's on my list of must-haves!! Your chair looks great, by the way!! Oh my gosh, I would LOVE a new slipcover for my IKEA couch!! YEH! Great give-away! I wanna win big-time! Wow....beautiful! Yes...I would love to be a part of this. How COOL! I want one! I'd love a new throw for my living room...something springy! Thanks for the chance to win! Window treatments for my home office would be awesome! I am sure they'd be beutiful based on the quality of the slipcover they sent you. Terrific! Oh wow! Nice! What a great giveaway! I have a chair that is desperate need if a slip cover. Great giveaway just in time to add some spring color into my home! I'd love some new curtains! I would love to win, so I could get one of their quilt coverlets! I really could use a slip cover for my couch! It is so outdated! Love your new slipcover, Wendy! And that pillow on the chair too! I completely know what you mean about commenting! Lately I have been reading most of my favorite blogs on my phone in the morning while I snuggle with Lillie and my phone doesn't let me comment and of course I never get back on the computer to leave a comment later that day because I am running around like a chicken with my head cut off and then always feel bad! I love coming and checking out your beautiful blog ever morning, though! LOVE it! I need a new slipcover for my couch in a big way! Love the slipcover you chose. I'd love a new one for my chair. I really need some slipcovers - my sofa is horrible looking! Great giveaway! We're considering our current Ikea cover a temporary one, so this would be perfect! It's great when someone offers a quality product for a good price. Comfort Works gives us an opportunity to freshen our homes and not break the bank. Thank you for the great giveaway! I was just looking at buying an ikea sofa! Would love to win and I am Aussie. We just moved into a new house so I would love some new drapes. Thanks for the great giveaway! I would love some new curtains! Oh, I would so love to win! I LOVE slipcovers! 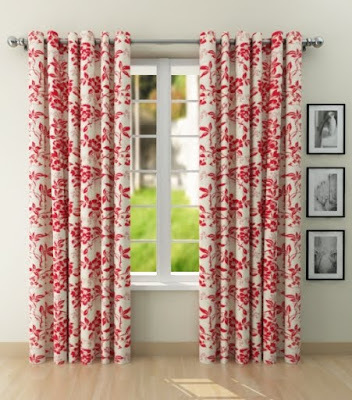 these look so great, but I could truly be in the market for some custom curtains!!! Oh Wow too cool!! 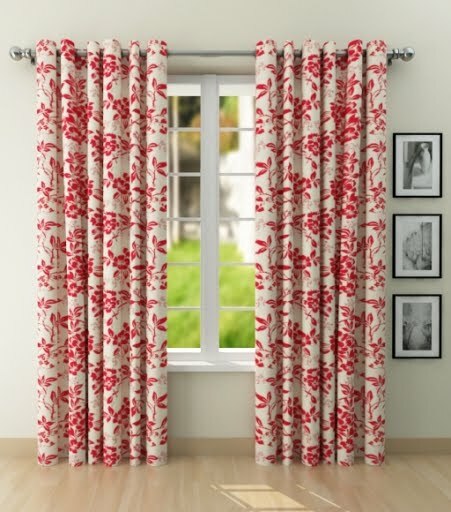 We are buying a new house right now so I will definately be in the market for new curtains! I've been wanting a good slipcover, and I need new curtains too! Awesome! I have something ikea in practically every room! i would love it! and i want to curl up with a book and a coffee in that chair. i think your picture is lovely and comfy. by the way, i visited the website and they are sooooooo helpful! i am going to email a picture and they will help me figure out how to measure it! sweet. thanks for the hook up girl! I would love a new quilt cover! Love their style!! What would I do without you to introduce me to all of these great recourses??!! I love that slip cover. And that sofa with the velvety finish!! Maybe I'll actually buy some Ikea furniture so that I could show off that slipcover, haha. OH My- what would I choose??? I would love new slipcovers! Thanks for the opportunity. 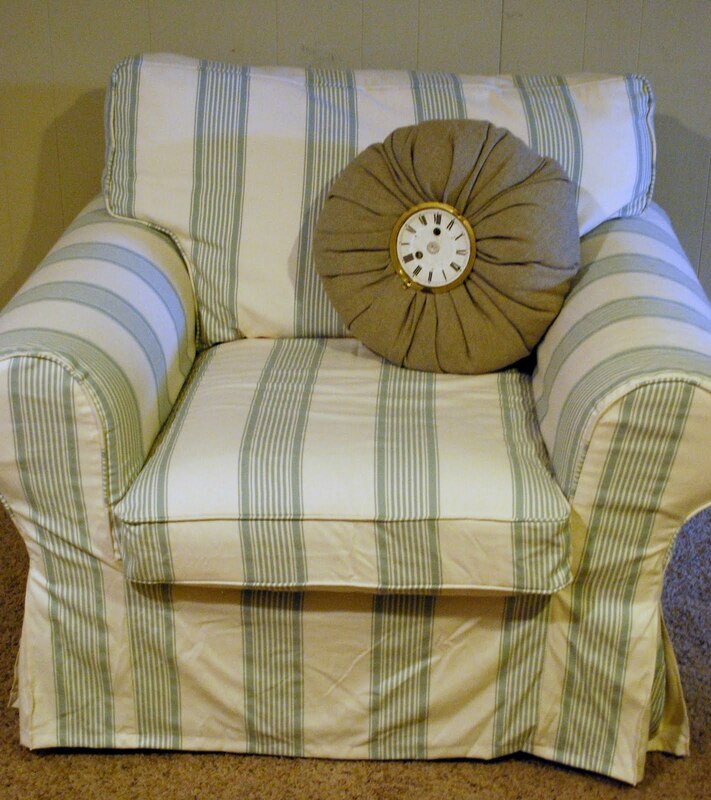 Your new chair slipcover is so pretty! I want a new slipcover for my Ektorp sofa!